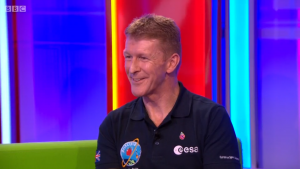 Friday was an exciting day for the Astro Pi mission, which will see British ESA astronaut Tim Peake operate two Astro Pi flight units, each one containing a Raspberry Pi and a Sense HAT, on board the International Space Station! 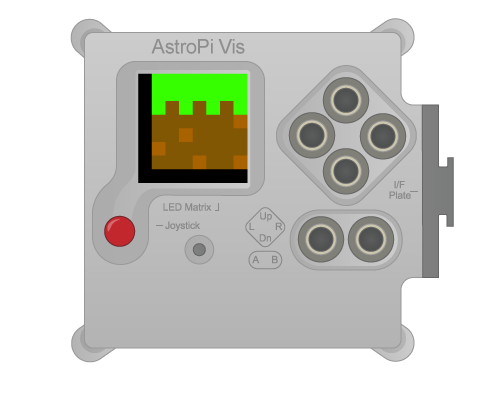 Tim will use the Astro Pis to run experiments and applications designed by UK school students as part of the Astro Pi competition, which ran earlier this year. We were all absolutely thrilled when we discovered that competition winner Hannah Belshaw would be appearing on BBC One’s very popular live magazine programme, The One Show, along with Tim Peake, who will fly to the ISS to begin his six-month mission, Principia, in December. 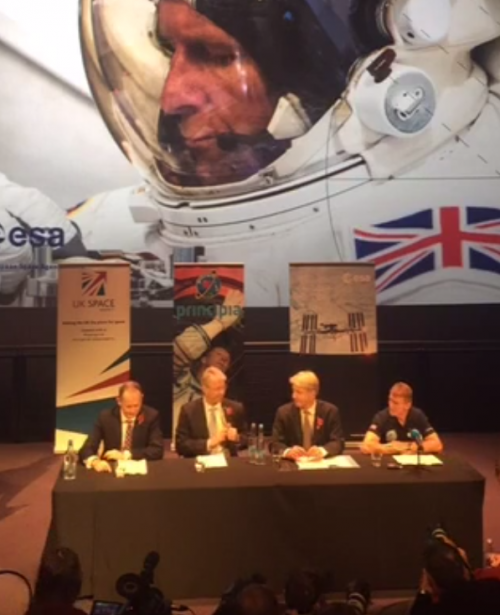 David Walliams and British astronaut Tim Peake join Alex Jones and Adil Ray. Tim features throughout the first half of the show, and you can find Hannah and hear Tim talk about the Astro Pi mission from 9 minutes 15 seconds. The programme on iPlayer is only made available within the UK, but no matter where you are in the world, you can see from our screenshots that both Hannah and Tim are very happy to be on the show! [T]his Astro Pi is going to be in various different modules running an experiment each week, and I’m going to send down the data so that during the mission [the schoolchildren] can see the data, see what they’ve managed to achieve, and if they need to modify the code they can send it back up to me and we’ll just keep that going throughout the mission. We’re enormously excited that school students will be able to communicate with Tim while he’s on the International Space Station! 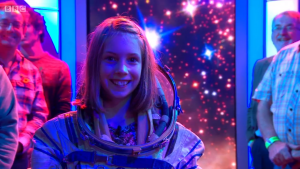 Hannah, who made her TV appearance wearing a real space suit, entered the Astro Pi competition with her design for a program that captures data from the Astro Pi’s many sensors for visualisation later in a Minecraft world. She entered at the primary-school level, so the code for her entry was written, under her guidance, by Minecraft expert Martin O’Hanlon. Columns of blocks represent environmental measurements such as pressure and humidity, and a giant, blocky model of the Space Station itself represents its movement and orientation, so that it will be possible to play back everything the Astro Pi detects while Tim Peake is running the program in space. An Astro PI flight unit in its flight case, displaying the icon for Hannah’s Astro Pi competition entry, SpaceCRAFT. Read more about Hannah’s idea, and find out about the fantastic applications designed and coded by all the other Astro Pi competition winners, on the newly relaunched Astro Pi website! And you can get involved: all the hardware (except for the specially designed, space-grade aluminium flight cases) is available to buy, so that while Tim Peake is operating the Astro Pis in space, you can use exactly the same equipment on Earth. Also on Friday, Raspberry Pi attended what will be Tim’s final UK press conference before flying to the International Space Station. Tim spoke about Astro Pi during the conference, too – you’ll hear him talk about it starting 25 minutes in, with slightly more detail than was possible within The One Show‘s format, but we strongly encourage you to listen to as much of the recording as you can, because it’s all tremendously interesting! Tim will launch on a Soyuz spacecraft from the Baikonur cosmodrome in Kazakhstan at 11:02 GMT on 15 December 2015, along with NASA astronaut Tim Kopra and Russian cosmonaut Yuri Malenchenko. They are expected to rendezvous with the ISS later the same day, at 16:58 GMT. Our Astro Pi flight units should already be there when they arrive, since they’re scheduled for an earlier flight with a planned launch date of 3 December. With both launches just weeks away, we’re immensely excited, not only about the Astro Pi mission, but also about Mission Principia as a whole. We’ll have more to say before launch and during the mission: watch this space! Shouldn’t that be “Peake-time audience”…? In space, no one can hear you groan. How about selling a plastic version of the Astro Pi Flight Case? A lot of youngsters (and me – not so young) would love one. Ever since being a youngster in the 60s I’ve loved army surplus and buttons to push :), and the Astro Pi case is COOL! Raspbery Pi ANYONE ??? Freshly made, and Astro Delivered. Congratulations Tim Peake, hope he gets Knighted when he returns back to the ground after a really cool mission. This Pi Never Spoils !!! We're sending Raspberry Pis to the International Space Station!